Meraas has showcased mock-up apartments at Bluewaters island, which will host the world’s tallest observation wheel, over 200 retail and dining outlets, hotels, and a vibrant plaza. The show apartment offers prospective buyers a taste of the plush island lifestyle the destination’s residents are set to experience, through exclusive access to the island. Located against the backdrop of Ain Dubai, soon-to-be the world’s tallest and largest observation wheel at over 210 m, the elegant development will boast stunning vistas of the Arabian Gulf and Dubai skyline. Bluewaters Residences will comprise four penthouses, 17 townhouses and 10 mid-rise residential buildings featuring 698 one- to four-bedroom apartments, ranging from 815 to 2,473 sq ft.
To cater to the needs of residents and visitors, the island will be home to over 200 retail and dining outlets in addition to a host of leisure and entertainment facilities, hotels, and a vibrant plaza – all of which are at advanced stages of construction. In addition, the island will be connected to the shoreline at The Beach by a 265-m pedestrian bridge, direct road access via a bridge to Sheikh Zayed Road and a unique driverless Group Rapid Transit system connected to the Dubai Metro. Bluewaters island ... home to Ain Dubai. Mohammed Al Malek, the senior vice-president (sales) at Meraas, says: “Since the launch of sales earlier this year, the Bluewaters Residences have attracted strong interest from a discerning clientele that appreciates the significance of a statement address. 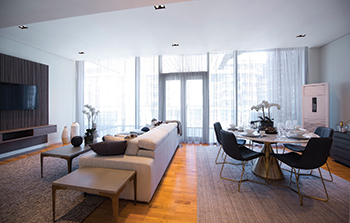 Finished to the highest standards, the interiors at Bluewaters Residences will sport a minimalist style in a neutral palette that combines the warmth of Scandinavian wooden floors with the opulence of soft metallic fixtures, he adds. Designed for modern living, the open-plan kitchens will be fitted out with hi-tech Italian appliances and seamless worktops. With floor-to-ceiling windows, all apartments will offer sweeping views, varying between Ain Dubai, the sea, a boulevard and green open spaces. With its unique selection of residential options, Bluewaters is set to blend the tranquillity of island and waterfront living with the vibrancy of an urban lifestyle. The community will feature a private landscaped garden podium, four swimming pools with changing facilities, a children’s pool with a splash pad and play area, two basketball courts, two gyms, and a dedicated outdoor fitness space.